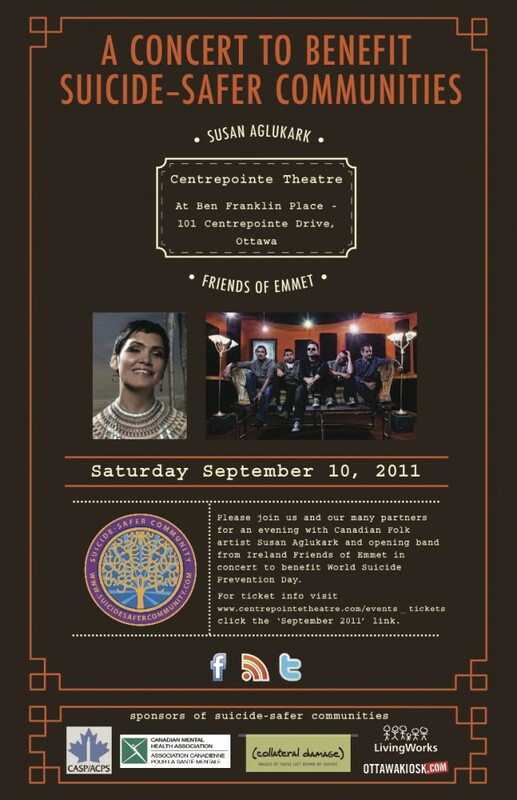 Don’t miss a celebration of World Suicide Prevention Day featuring three-time Juno Award winner singer/songwriter Susan Aglukark and Irish rock band Friends of Emmet. Susan Aglukark is one of Canada’s most unique artists, a leading voice in Canadian music and Chair of the Arctic Children and Youth Foundation. Friends of Emmet have just released their single ‘Coming Apart’ with all the proceeds from the Canadian sales going to the Collateral Damage Project. All proceeds from this event will go to the Collateral Damage Project, the Arctic Children & Youth Foundation and to support LivingWorks SafeTALK and ASIST training in Ottawa.